Vegan Eats and Treats! : Vegan Thanksgiving! I hope you all had wonderful celebrations, whether they were big or small. We just got home from our big family dinner, and it was very nice. Our family basically does a potluck, and every year I am in charge of bringing the dessert. This is because I am the family member with the most interest in baking, and also because this is my way of guaranteeing that I will be able to eat dessert! When I first became vegan 6 years ago or so, a few people were a bit resistant to my vegan pumpkin pies... but over the years all that has faded entirely, and the desserts are gobbled up happily. 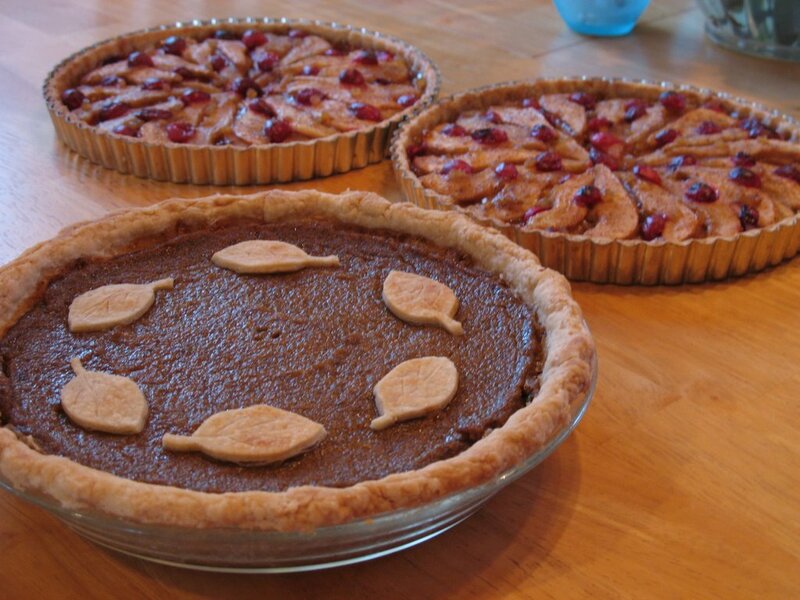 I made one pumpkin pie, from a recipe I adapted and veganized, and two of the Pear Cranberry Tarts. I promise not to make any more Pear Cranberry Tarts any time soon... but these were SO SO SO good! I made sure my pears were ripe, and the tarts were amazing. It's fun arranging the pear slices in fancy, artful fans. I'm sorry to say that I got so busy eating that I didn't take a picture of my plate (bad vegan blogger! ), but it was delicious, nutritious, and 100% vegan! Hoorah! Whoa, those are to beautiful!! I love the pastry leaves you cut out for the top!! The pear tarts look so good! Those pies are so lovely. I love the leaves on top of the pumpkin pie--really adds to the beauty! I am glad your Thanksgiving went over well! Thanks! I only learned a couple of years ago that you could put little shapes on top of a pumpkin pie. It's so fun, isn't it? I just cut them out of the left over scraps. I think I am already having an idea for how to decorate my Christmas pumpkin pie. mmmmmmmmmmmm, your pies look amazing. it was the one thing i wish i'd made yesterday so i could enjoy. i do so love a good pie on thxgiving. you've inspired me! for christmas i'm going to have to wow them with vegan pie. ;) thanks! those pies look great! send me one!! I missed out on the pumpkin pie this year:( oh well, plenty of pumpkin puree in the freezer! Your pies are too beautiful! I'm so glad it's easy to make vegan pies for all to enjoy. You are so smart to put yourself in charge of dessert! thanks! Glad to hear that you appreciate my secret dessert plan! I bet that pear tart could be gluten free pretty easily. oops! Sorry I missed a couple of comments there! Thanks so much for telling me about the green goddess potatoes by the way. it reminds me of the croation chard-potato combo I made recently. I read recently that the average american eats 7 pieces of pie per year - I think this is an unacceptably small number! Yes - wow them with pie! I wish I could send you a pie. That sounds fun. :) You gotta make yourself some pumpkin pie - it's just so darn good! Such beautiful desserts! Those tarts look especially fantastic! Those pies are absolutely elegant! Beautiful -- that photo should be in a cooking magazine! I made the pear cranberry tart for Thanksgiving after seeing yours, and everyone raved about it. I seriously want to make more of them while there are still fresh cranberries. This definitely makes it on my list of favorite desserts. Thanks! yeah, the pear tart is cool, because it's so easy, and it's also really easy to make it look really fancy! What a combo. And, best of all, it's super tasty! I'm so glad to hear that your tarts were a success, so were mine! I think I'll make them again at Christmas time. If it ain't broke, don't fix it!